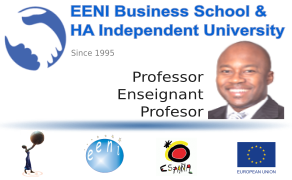 Why study with EENI Business School & HA University? EENI Business School & HA University is focused exclusively on International Business Education Programs (Bachelor of Science, Masters, Doctorates and Courses) since 1995. Our “educational core business” is international business (foreign trade, global marketing...). Global business changes extraordinarily fast; only an exclusive focalisation allows adapting to change. Leadership. This specialisation makes it possible to be world leaders. 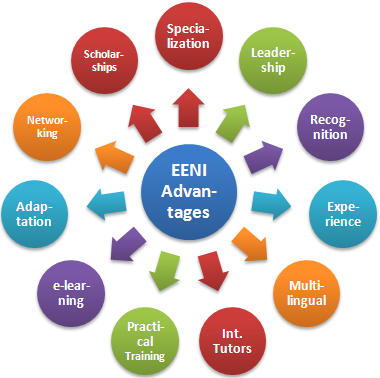 For example, EENI is the only business school in the World having specialised regional masters (eLearning): Master of Science in International Business in Asia, Africa, Emerging Markets, America or the Pacific Rim. Experience. EENI Business School & HA University has more than 20 years of experience in e-learning of international trade . Professors and Coaches are fundamental in our training model; the Professor is always available to the student. A team of Professors will respond to the student's questions and evaluate the exercises. Each course contains exercises that are evaluated, which the student must work out and pass to obtain the diploma. Students should expect to dedicate a minimum of 12 hours per week working on lessons and assignments. The course learning materials have been developed by a group of more than thirty scholars (University professors, Entrepreneurs, and Director of International Business) on International Business from several countries, with the aim of offering a “glocal” (global/local) approach to EENI's students. The first edition was published in 1996, every year we update the courses and add new contents. Instructional Materials are distributed in a digital format and are downloaded from the e-Campus. It is unnecessary to be connected to the Internet to study it. EENI Business School & HA University works with the case method, a method of learning by presenting a business Case Study (the concept of “best practices and world-class”). Case studies are provided to give to the student's practice dealing with some topics that were discussed in the course. In the globalisation age is necessary to have knowledge of languages, for that reason, the learning materials are available in several languages for improving your international communication skills. The courses are available in English, Spanish, French, and Portuguese, some subjects (learning units) are available in Russian, Chinese, or Arabic. The student has free access to course materials in these languages. Adaptation to each country. Strategy G-R-L (Global, Regional, and Local). 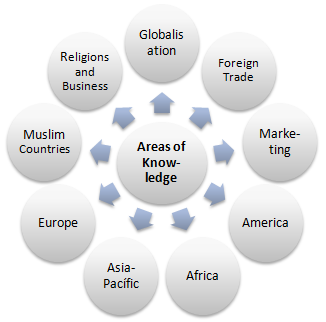 Contents of the courses are adapted to each country's context. By ex. The Master of Science in International Business (Foreign Trade, International Marketing, and Internationalisation) is customised to more than 180 countries (Asia, America, Africa, Europe, and the Middle East). Networking with students from over hundred countries. 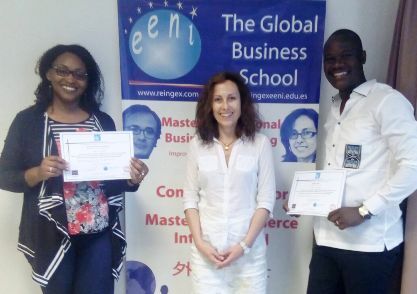 Many prestigious International Trade leaders around the world have profited from EENI's professional courses and have used skills, expertise, and knowledge gained to bring practical benefits to the world of international business. The e-Campus is an e-learning platform with the objective to compliment the materials delivered and to provide support to students throughout the duration of their studies. When a student is registered for a course, diploma, or master; they will receive by e- mail the access codes to the virtual campus. Customised education. One of the competitive advantages of e-learning is to be able to offer a customised education to each student, and that is what makes our model different. It allows, under the coach supervision and within the limits marked by the course, each student to develop those concepts they need most for their professional activity. E-Learning is a flexible way to learn; e-learners are those people who are unable to attend regular classes because of work or personal commitments or because they live too far away from the college's campuses. The students who need to improve their knowledge, who are eager to learn and who are willing to participate actively in the course, will find in this learning model all the necessary means to improve their work perspectives and knowledge. The formation is related to the knowledge that the students are going to gain, by understanding the needs of the market through an analytic view provided by our international team. The aim of the programs offered at EENI Business School & HA University is to ensure that the students acquire effective skills, a valuable attitudes, values, and tools to deal successfully with the world of work according to their competence profile. The goals to achieve by EENI Business School & HA University.